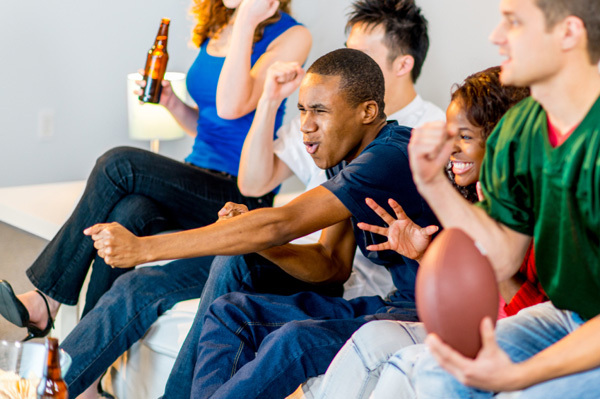 And if you’re thinking of hosting a game party, consider this post your play-by-play guide to everything you need to be game day ready. 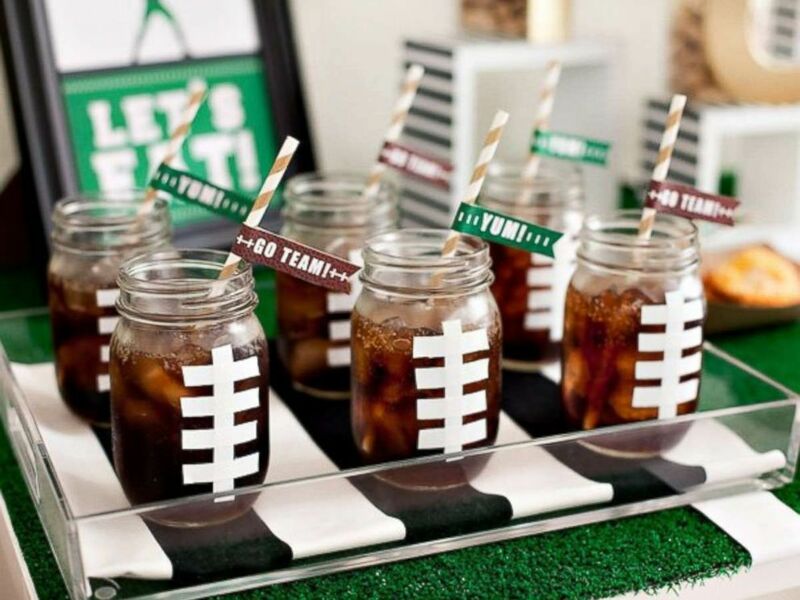 You’ll want to fuel up your guest with appetizers before, during and after the game. This will help you get your guest hyped and more importantly, ensure no one is drinking on an empty stomach. Here are a few recipes I recommend. This variety of apps is awesome, there’s a little something for everyone. Bake for 30 minutes, until potatoes are tender. Place cheese squares in between a few of the cuts on each potato. Return to oven for 5-10 additional minutes, until cheese has melted. Let cool 10 minutes before topping with sour cream, bacon and green onions, or your desired toppings. Serve warm. Makes 10-15. Do yourself a favor and order these from your neighborhood wing restaurant, like Buffalo Wild Wings. You’ll save time. If you prefer at home wings, here’s a recipe. Add the ground beef, mushrooms, onion, seasoned salt, chili powder, and cayenne to pan. Cook, breaking up the meat with a wooden spoon, until the mushrooms release their liquid and the meat is no longer pink, 7 to 8 minutes. Stir in the garlic and cook for 1 minute. Add 2 cups water, brown sugar, tomato sauce, and kidney beans to pan; bring to a boil. Reduce the heat to medium-low; simmer until chili thickens and the liquid reduces slightly, about 35 to 40 minutes. *The chili tastes better the longer you let the flavors mingle. In between plays, you can entertain guest with conversation about million dollar commercials or you can put your football knowledge to the test. Here are a few football trivia questions. Q: Which football team holds the record for the most appearances in the playoffs? A: Tied with Dallas Cowboys 32, Green Bay Packers 32 and New York Giants 32. 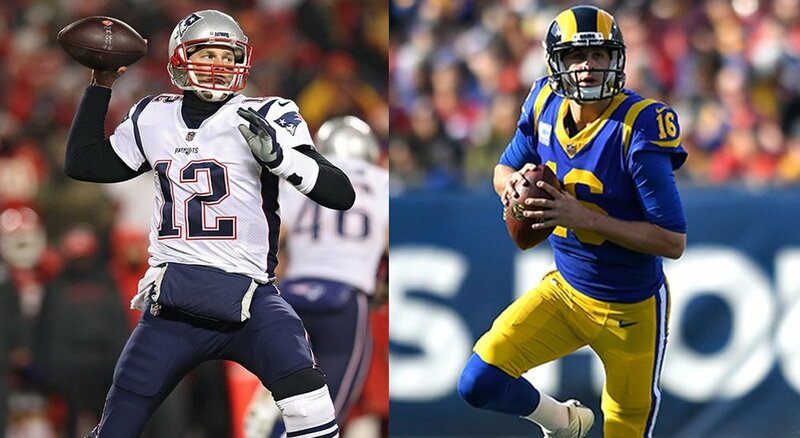 Q: Which two cities have hosted the most Super Bowls? Q: During the 2017 season, which player set the record for the most single-season passing yards and touchdowns? Q: Which player was the #1 draft pick for the 2018 draft? Q: What team won the Super Bowl last season? Combine sugar, water, passion fruit puree and lemon juice in a saucepan over medium heat. Stir until sugar has dissolved. Allow the mixture to cool, and the sliced lemons, and pour into a pitcher. Serves 4 to 6. Build in a pint glass with ice and garnish with a lime wheel. Serves 1. Combine grapes, honey and lemon juice in a blender until smooth. Pour into pitcher. Add the vodka and sliced grapes. Cover and refrigerate until cold, at least 1 hour. Add the rosé to the mixture just upon serving. Serves 4 to 6. Players - There are 22 players on the field, 11 offense and 11 defense. Offense - Attempt to score! Quarterback (QB) - Receives the snap and passes the ball or hands it off. Running Back (RB) - Gets handed the ball from the quarterback, then tries to run through all the defensive players. Offensive Line - They keep the defense away. Line positions include center (snaps the ball into play), guards and tackles. Tight End (TE) - Either acts like an offensive lineman or catches the ball like a wide receiver. Defense - Attempts to stop the other team from scoring! Defensive Line - The defensive ends and tackles who battle head-to-head against the offensive line. Linebacker (LB) - A player who lines up behind the defensive line to tackle the quarterback or defend against the pass or run. Defensive Back - The so-called secondary defends against the pass from the QB and helps stops the run. Special Teams - Players used in kicking situations, like punts, field goals and kickoffs. Kicker - A player who tries to kick field goals. He’s also responsible for the kickoff. Punter - A player generally brought in to turn the ball over to the opposing team on the fourth down. Plays/Rules - During four 15-minute quarter, the offense tries to run, pass or kick the ball into the end zone. Kickoff - The kick that puts the ball into play to start the first and second halves, or after a touchdown or a field goal. Down - A chance to advance the ball. If the offense doesn’t move the ball 10 yards in four downs, they must surrender it to the defense. Touchdown - Everyone knows this, but it’s when a player whether running, passing, returning a kickoff or punt, or recovering a turnover, a team scores a touchdown by advancing the ball into the opponent's end zone. Extra Point - A kick, worth one point, when an offensive ball carrier is tackled in his own end zone. Safety - A score, worth two points, when an offensive ball carrier is tackled in his end zone. Two-Point Conversion - After a touchdown, the offense can try to score two point by running or throwing the ball into the end zone. Field Goal - A kick worth three points. It’s usually tried on a fourth down from inside the 45-yards of the goalposts. What team are you routing for? I’m cheering you on…now go run the ball. Was this post helpful? Let me know in the comments.